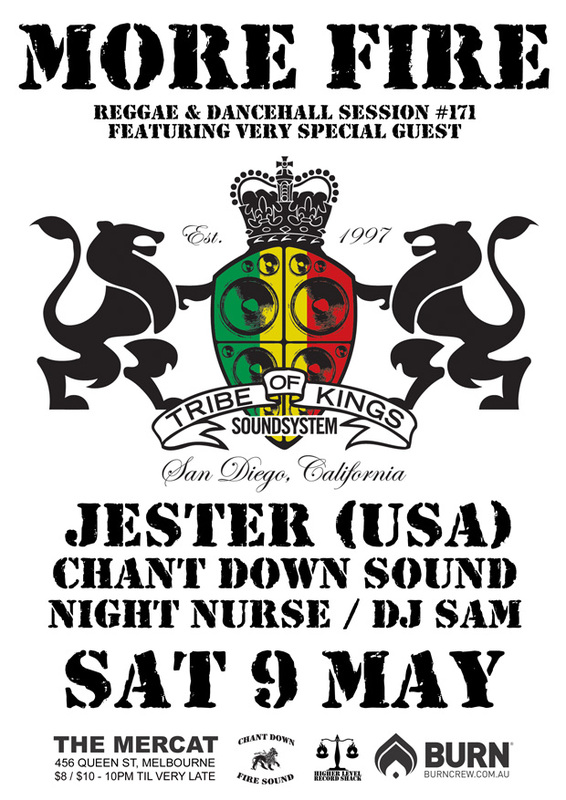 It’s an international link-up at More Fire in May, as Chant Down plays host to DJ Jester of California’s Tribe Of Kings soundsystem. San Diego’s premier reggae dancehall crew, the Tribe run things five nights a week in their home town, and have played shows all over the world. This will be Jester’s fourth time in Melbourne, and as anyone who has seen the Tribe Of Kings play previously will attest – when it comes to dubplate specials, these guys don’t mess around. Also playing on the night are Chant Down residents Jesse I and Ras Crucial, plus DJ Sam, and Night Nurse (making a long-awaited return to the decks!). More Fire # 171 takes place on Saturday 9th May at The Mercat (456 Queen St, Melbourne). Doors open at 10pm, with a cover of $12 or $10 for concession holders and PBS members.